Half Chevron stitch is an interesting variety of Chevron stitch with one side of the stitch being worked with a similar hand motion. 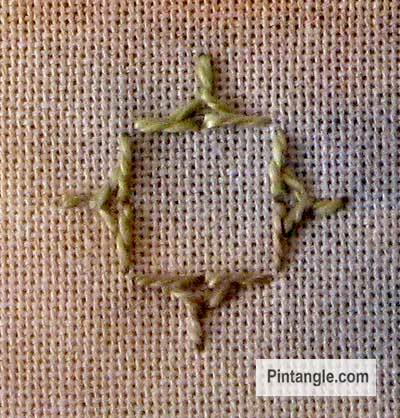 You can work this stitch on plain and even weave fabric in most types of embroidery thread to create useful border or outline stitch, which follows curves well. This stitch is great to use as a foundation line of stitching on the seams of a crazy quilting project. You can work this stitch back to back with the points facing as in the sample above. Work from left to right on two imaginary parallel lines. If you are working on fabric that is not an even weave you can mark guide-lines on the fabric using one of the fade out or water dissolvable pens available on the market but do make sure that it will disappear as this stitch does not cover the whole line marked. Bring the thread out through the fabric on the left of the lower imaginary line. 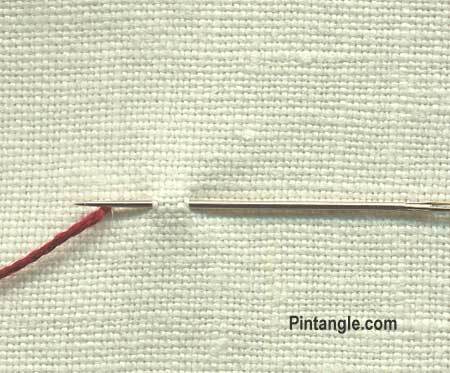 Insert the needle a little to the right on the same line, and with the needle emerging at the middle make a small stitch. 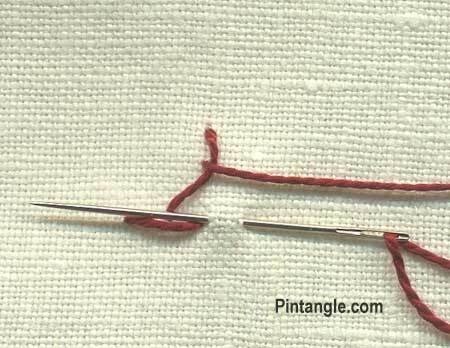 Take the needle up and insert on the upper imaginary line and make a small stitch pointing the needle downward. Have the thread looped under the needle. Take the needle through the fabric. 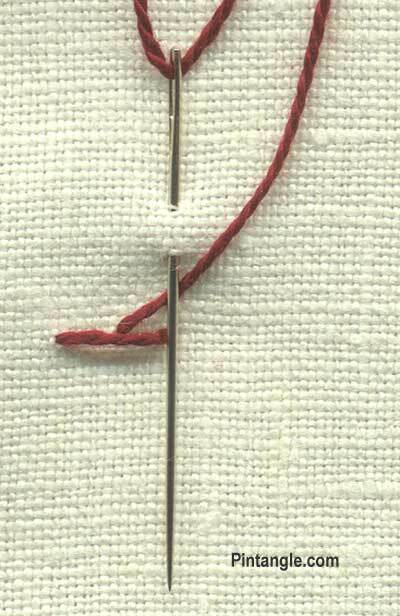 Move diagonally across to the right and insert the needle on the lower line, bringing the needle out a little to the left, and pull the needle through the fabric. Still working on the bottom imaginary line take the needle across to the right and insert, bringing it once again out in the middle. Work this way along the row. Half Chevron stitch is very effective worked back to back and you can build up interesting and complex patterns using it. Take some time to experiment as you can do simply oodles with this stitch. Beads can be added, ribbons or thread can be laced through the stitch and you are really only limited by your imagination. You can stack this stitch overlapping row upon row to create a patterned filling stitch. These are single half chevron stitches that have been turned on their side. 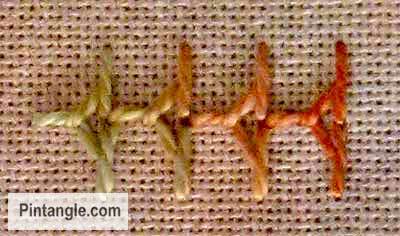 Once again it is easy to add beads to this formation or use it for couching. You can also work a line of stitches on a curve. Another way is to work single instance of Half Chevron stitch is to place them in a square which is effective as a little motif that can be repeated to build up patterns. You can also place the individual stitches in a cross which can also be used a repeating motif to build up patterns – or you can combine the two! Yet another option with this stitch is to swing either side of the line, individual half chevron stitches back to back to form patterns. The stitch can be worked on a gentle curve and when you swing them from side to side even more interesting things happen. Have Pintangle delivered to your inbox! when I update which at the moment is 2-3 times a week. If that is too much for your email inbox my newsletter is written every few weeks with a summary of what has been happening or when there is BIG news to share. 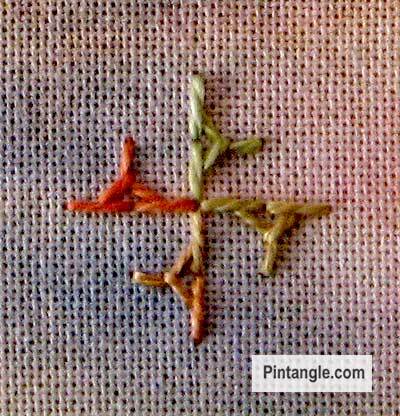 I am posting other stitches as I complete them …. I am loving my return to embroidery. Thanks Sharon! I dont know Sandhya – did you go to the front of the blog? why am i not able to see the TAST entry for week 20? i’m finally getting my post for this stitch into the mix. it was a new one to me but i found it interesting and full of possibility. If Maureen is just posting… then I can’t be too late. I have done a small sampler with this stitch. Here it is. I have done a sampler with this new stitch. Here it is. I have completed Week 18 – Crossed Buttonhole and Week 19 – Half Chevron . Pictures are on Flickr. Feels good to be caught up and finished on time! First time I’ve finished in time to catch you before you make your rounds. Fun stitch! I used the Half Cretan stitch to fix a small square of needle lace (I assume that it is needle lace). In fact I made two samples. Patterns made with half chevron! I have completed my weekly exercice, you can have a look here http://j-en-revais.blogspot.com/2012/05/tast-19.html if you are interested. Likewise – I had fun with this one! I’m still fighting with crossed buttonhole. I really enjoyed this stitch, here is my half chevron i have called “Fantasy” on my blog. it is also on my page on stitchinfingers. Here´s my Half Chevron Stitch work . Hi Sharon, my first post for the week Thank you for nice comments, always appreciated!. Thank you all! http://christinaroland.blogspot.com/2012/05/tast-week-19.html Loved this stitch as much as the chevron. Will use it a lot. My first attempts did not go well. But at least I completed my sampler page. I have posted week 19 challenge here. I have missed seven weeks of TAST as my spine op has disrupted life far more than I thought it would. But there is only one stitch in those weeks that I have not done before so hopefully soon I’ll stitch something with them all explored more. But I will do another work with this stitch and post it later.